It’s Fall which means cool weather (if you live up North), pumpkins (of course) and if you’re my husband, candy corn. I’ve never been a big fan of the actual candy corn candy so I decided to put my spin on it by making candy corn cookies. The original recipe came from Betty Crocker but I was disappointed to see it used a mix. I’m not a big fan of cookie mixes because I think homemade cookies always taste better. So, I went to my stand-by Texas Sugar Cookie recipe and adapted it to make these cookies. This sugar cookie dough is the easiest cookie dough you will ever roll out. Even if you’re not rolling it out (like for these cookies), it still handles well and of course, tastes delicious. The nice thing about these cookies is that they become a slice and bake cookie, so you will end up with lots of mini candy corn cookies in no time at all. The other good thing? These cookies freeze great so you can make them ahead of time and serve them at any of your upcoming Fall parties! I’ve also discovered that the best way to dye your dough the correct color is to use Wilton food dye (affiliate link). You can buy it at Michaels, Hobby Lobby or online. A tiny toothpick of dye will get your dough the exact, vibrant shade of yellow or orange that you need. I use Wilton food dye for anything I need to dye now. It’s amazing! Cream butter and sugar in mixer. Add in eggs, vanilla and milk. Slowly add in baking powder and flour. Once you have this dough mixed, it’s time to make the candy corn cookies. Divide the dough into three equal-ish piles. Just do your best to make it even! Leave one bowl as is. Using food dye, color one bowl yellow and the remaining bowl orange. Line a bread pan with seran wrap. On the bottle of the pan, evenly press the white dough. Next, layer on the orange dough with the yellow dough on top. Fold the remaining seran wrap over the top and refrigerate the dough for 3 to 4 hours. When the dough is firm, remove it from the refrigerator and cut the dough into slices (like bread). Then, using a knife, cut the dough into small triangles, alternating angles of cut. You can view all the steps below. 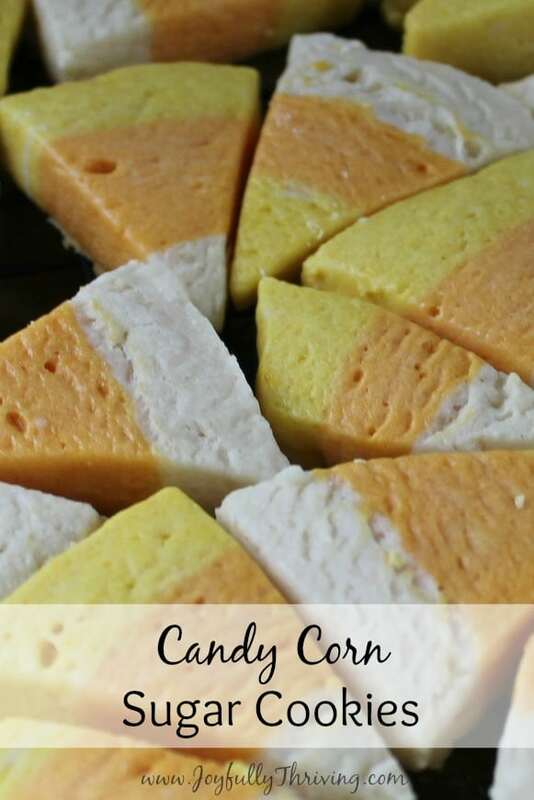 Careful place candy corn cookies onto a cookie sheet. Bake at 350 degrees for 8 minutes. Cool on a baking rack. Enjoy your candy corn! These simple candy cane sugar cookies will make you a hit with kids and grown-ups alike. These easy cookie dough recipe makes this festive cookie a fun treat! Add in eggs, vanilla and milk. Slowly add in baking powder and flour. Once you have this dough mixed, it's time to make the candy corn cookies. Divide the dough into three equal-ish piles. 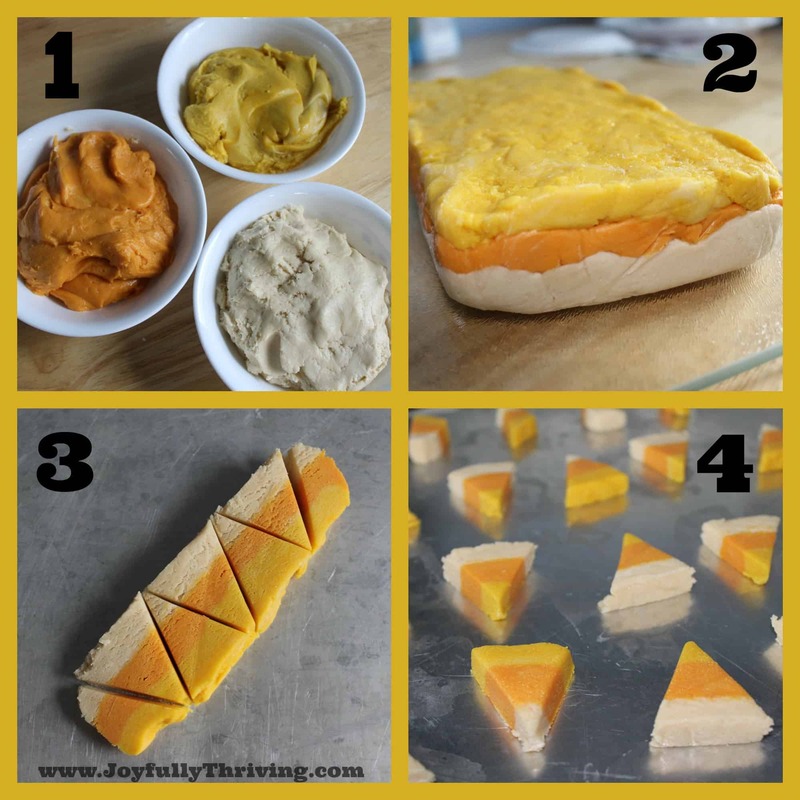 Using food dye, color one bowl yellow and the remaining bowl orange. When the dough is firm, remove it from the refrigerator and cut the dough into slices (like bread). Then, using a knife, cut the dough into small triangles, alternating angles of cut. Carefully place candy corn cookies on ungreased cookie sheet. Bake at 350 degrees for 8 minutes. Cool and enjoy!